In the sleepy countryside of Yongding County, surrounded by lush green forests and misty mountains, the village of Hongkeng may not be the liveliest place in Fujian, but its certainly one of the most unique. 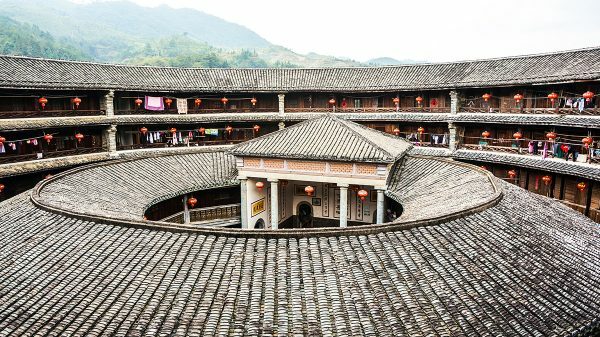 This village is home to over 100 tulou of various shapes, styles, and sizes; of which 13 were built during the Ming Dynasty (1368-1644) and 33 were established during the Qing Dynasty (1644-1912). These tulou are gigantic, fortress-like buildings made of packed earth that were initially designed to protect inhabitants from bandits and wild animals. They resemble fortified villages and come in a variety of styles, from those of a square or rectangular shape to round and oval ones. With all of these unusually shaped buildings, Hongkeng must surely feel like a square peg in a round hole! The first of these tulou were constructed by the Lin family during the 13th century but tragically several of the originals, including Chongyu Lou and Nanchang Lou, have since collapsed. Yet it seems the Lins were trendsetters, because it wasn’t long before other branches of the Lin clan started building their own tulou in the village. Of the many earthen structures that rise up out of the village grounds, Zhengcheng Lou, Fuyu Lou, Kuiju Lou, and Rusheng Lou have garnered the most fame. Zhengcheng Lou was built in 1912 according to the Eight Diagrams of Bagua theory. The two wells within this tulou represent Yin and Yang, while its three gates symbolise heaven, earth and human beings respectively. The external ring of the compound is a four-storey building that has been divided into eight units or “gua”. The branch of the Lin family that established Zhengcheng Lou had also studied abroad in Europe and thus incorporated many Western features into their tulou to make it stand out. It seems T. S. Eliot’s famed proverb “good poets borrow, great poets steal” can also be applied to architects! Fuyu Lou, on the other hand, is a completely different style of tulou known as a “Wufeng” or “Five Pheonix” tulou. Built in 1882 by three brothers, it was designed to look like a phoenix spreading its wings and its appearance was heavily influenced by Han-style architecture. The exterior supposedly looks like three mountains rising towards the sky, as the brothers wanted to imply that they were as magnificent as mountains. Modesty evidently wasn’t a family trait! From mountains to mansions, Kuiju Lou is a large, square-shaped tulou that was built to resemble a palace, earning it the alternate name “Potala Palace”. Unlike many of the other earthen buildings, the interior is bedecked with sculptures, colourful murals, and complex architectural features. After all, a man’s house is his castle, and a family’s tulou is their palace! Size may have mattered to the owners of these first three tulou, but Rusheng Lou is famous precisely because it is the smallest tulou in existence. It was built sometime between 1875 and 1908, and is just 17 metres in diameter, with only three-storeys and 16 rooms to house its inhabitants. The name “rusheng” means “as if to rise”; perhaps because the optimistic owner hoped it would grow over time!